The first time I heard Tinariwen was on a hot July night in 2005 at the Old Town School of Folk Music's annual Folk & Roots festival. I approached Welles Park from the west, and as I got closer the sounds of what I now know as desert blues reached my ears for the first time and enveloped my senses. The air was full with the vibrations of electric guitar, drums, and deep vocals pierced occasionally by the trill of women ululating. 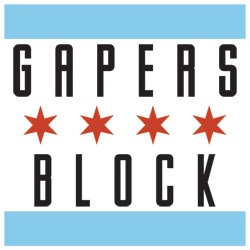 Western psychedelic '60s rock of the Jimi Hendrix variety mixed with West African rhythms to create a trance-like mood, the park was filled to capacity with revelers, and outside the gates people stood on sidewalks and CTA bus benches, swaying to the music. The sun had just begun to set, and the quality of the light hitting Western Avenue at dusk added to the feeling that I had just stepped into another dimension. On stage men and women in blue robes and dark turbans, some with their faces obscured by swaths of fabric, played guitars and drums and sang in a language I didn't understand. The open air of the summer concert captured all who came within earshot, and I was completely mesmerized. Determined to get as close to the source as possible, I paid the modest $5 entrance fee at the gate and slowly weaved my way to the front of the captivated crowd. Since that magical evening five summers ago, Tinariwen has returned to Chicago several times, and I've had the pleasure of seeing them in a couple of different venues. In the concert hall of the Old Town School of Folk Music, their performance became an intimate gathering of friends, and at Martyr's the crowd stood so tightly together, and so close to the stage that we could see sweat beads form on the musician's foreheads. Tinariwen will once again be playing at the Old Town School of Folk Music this weekend for two back to back concerts on Saturday at 7pm and 10pm, and a third concert has been added Sunday at 7pm. A Sunday guitar and percussion workshop is also on the schedule at 3:30pm. Tinariwen are a collective of Tuareg singers, songwriters and musicians who began playing music in the Sahara Desert in northern Mali, and their story is as captivating as their music. After independence came to Africa in the 1960s, Tuareg territory was divided among the nations of Niger, Mali, Algeria, Libya and Burkina Faso. Ibrahim Ag Alhabib, the band's founder, was just four years old during the uprising of 1963 in Mali that claimed the life of his father. He grew up in a refugee camps in Algeria, and although he had only ever seen guitars in Western movies, he created one from a tin can, a stick, and bicycle parts, and began playing Tuareg melodies and Arabic pop songs. He ran away from home at nine years old for work, finding odd jobs in Libya and Algeria, and connected with other exiles along the way who shared his passion for music. They formed a group and began writing their own songs, a break from traditional Tuareg verse, and their songs depicted the sense of longing that comes with being exiled. They began to be known as "Kel Tinariwen", which roughly translates as "The Desert Boys." Tinariwen now has two generations of band members, among them are: Mohammed Ag Itlalte; Abdallah Ag Lamida; and Alhassane Ag Touhami. Ag Itlale, known as "Japonais," has penned songs such as "Tamodjerazt Assis," where he speaks bitterly that regret is like a termite, eating the heart from the inside, a turn of phrase that reflects the poetic depths of traditional Tamashek verse. Ag Lamida, dubbed "Intidao," represents the younger generation of the band. His passionate concern for social causes echoes Tinariwen's long commitment to change and improvement in their community, and his condemnation of the widespread unemployment and apathy plaguing his people is evident. Ag Touhami's fierce spirit as a guerrilla fighter earned him the youthful moniker of "Lion of the Desert." His lyrics have taken on a serious philosophical bent, contemplating the value of life and loss. 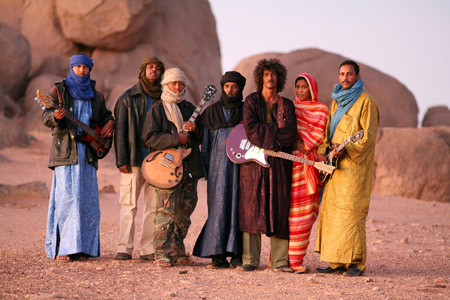 Tinariwen has been influenced by a wide range of music, from Tuareg traditions and the Moroccan protest music of bands like Nass El Ghiwane and Jil Jilala to icons such as Elvis Presley, Led Zeppelin and Bob Marley. They first gained wide recognition at the first Festival au Desert, an annual gathering of music in Mali that began in 2001, and have released four albums: The Radio Tisdas Sessions, 2001; Amassakoul, 2004; Aman Iman, 2007; and Imidiwan, Companions, 2009. Ibrahim, who has not been able to join the group on recent North American tours, will be joining the band this weekend at the Old Town School of Folk Music. Space is limited; there were standing room only tickets the last time I checked, but if you want to see them for yourself, act fast. 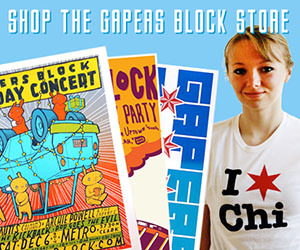 For tickets and information call 773-728-6000 or visit the Old Town School of Folk Music. What great music and a great story, too. Thanks for bringing it to my attention! 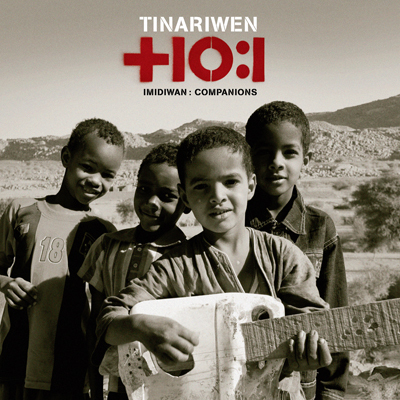 Hope I can make it out, Tinariwen is easily one of my favorite discoveries of this decade. Such great, powerful music.